An extended vocabulary for KM4Dev to describe ourselves now and in the future was one of John Smith's major contributions as part of his consultancy on KM4Dev futures. This vocabulary was introduced along with a framework illustrated below to help envisage different ways that KM4Dev might develop in the future. In the report four scenarios are laid out, one describing the current situation and three describing possible futures. In his final report John suggests that KM4Dev identity is currently informal and interactionist in nature. 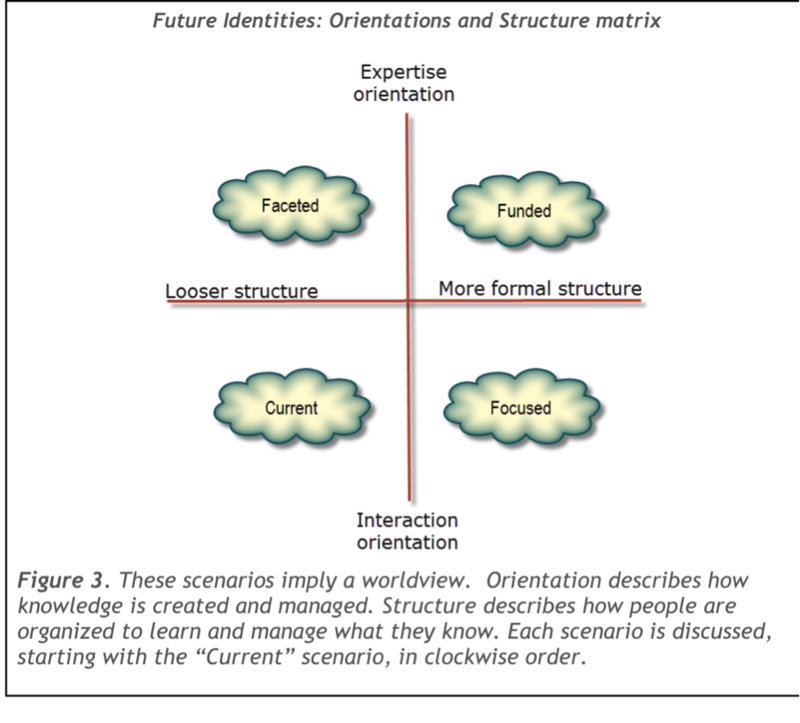 Thinking through the implications of being located in another quadrant seemed a good way for a group of KM4Dev members to reflect on the implications of John's report as well as all the other material from KM4Dev that informed his thinking. We recorded in a Google document the process and outputs - including our rich pictures - from that March 2014 meeting. This blog is a personal reflection on KM4Dev futures - mainly the reality but also the project since we've been in it from the beginning! With Nancy White, we compiled (from years of drafts) the final application to IFAD for a project that focused on KM4Dev, what it can and does contribute, and how it might evolve; with Natalie Campbell, we coordinated the KM4Dev Social Network analysis that was the first product of the project; and then we took on a project coordination role for John's work. The notion of multiple knowledges was at the centre of the much missed IKMemergent project. And I think it helps in understanding that KM4Dev operates already in more than than one quadrant, something that became clear to us in the Hague (and online). Jaap Pels did a mapping that illustrates it well, with a page on the wiki to gather ideas. people cluster around ideas, usually suggested or led by one or two people; those people stay in the network, report back, engage with the KM4Dev Core Group as necessary, develop short-term (like face to face meetings) or longer projects (like the KM4Dev journal). Crucially, KM4Dev as a network flexes to accommodate those ideas and projects. If there is energy and some leadership then activity happens, and when it is over, it is over, to borrow from the Open Space principles. This potted history of the Km4Dev journal, lifted from the meeting documentation, illustrates the point. A group of individual members started the journal because they wanted to. They consulted within the network, and the core group, and have been running it since 2005 as volunteers. In 2009 funds became available from the IKMemergent project to support its becoming a print journal, published by Taylor and Francis (T&F). The decision to move to a printed, published journal, caused controversy within KM4Dev. Some people opposed the move on the grounds that the journal ceased being an Open Access publication, although 200 free print copies were available. Some of the founder members decided to move the journal to T&F, from where it was published between 2009 - 2012. When the funds ceased the journal move back to an Open Access model, from 2013 onwards. We suggested the significance of this example is that, firstly, the journal represents a focus on capturing, ‘reifying’ knowledge into collections of articles. The move to T&F was in order to benefit from the more formal status of an academic journal and some argue that the content became more ‘academically rigorous’. In this sense the journal as a whole, and the move to T&F, represent a position where expertise, formally captured, is seen as at least as important as the interactions at the core of KM4Dev. The second significant lesson from the history is that it illustrates the benefits - and risks - of a loose structure. A group of individuals started the journal, from within the community. A group of people made a move that other people opposed, yet the material being published largely came from within KM4Dev, which continued to support and promote the journal. It is now back in Open Access format, because the same, dedicated, group of individuals decided to put the time to re-establishing the journal in the Open Journal platform. Km4Dev enabled, supported, and flexed to accommodate the trajectory of the journal. It’s interesting to speculate what would have happened if there had been a more formal structure to which such a set of decisions would be taken. Would a more formal structure have been more rigid, and in consequence taken decisions that resulted in a split - as is so often the case in organisations that are less supple than the loosely organised KM4Dev. 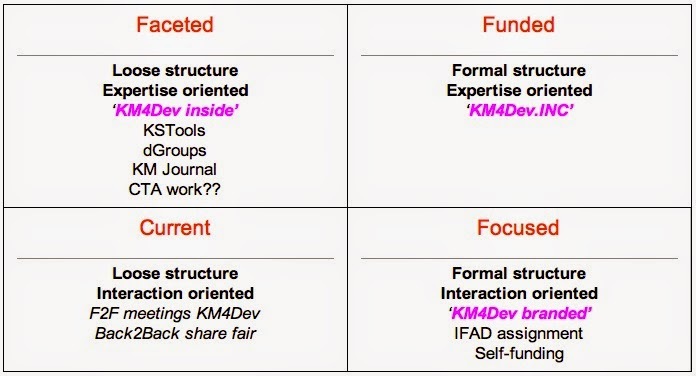 We've also done a case study in the meeting documentation of the IFAD project, to illustrate how KM4Dev operates in the 'Focused Quadrant, where more more formal structures develop but the predominant value is an “interaction” orientation to knowledge production, rather than an “expertise” orientation”. Formality, in the sense of more detailed and bureaucratic structures for governance and management, is the dimension that worried us the most in our meeting - concern that was reflected in the various conversations that took place online in the KM4Dev network. The IFAD project illustrates both the strengths and weaknesses of the current informal structure. On the plus side, a lot was achieved in terms of research, useful reports, conversations - both 'directed' and emergent - in the network and the richness of the work that John led, co-created from and with KM4Dev members. However, I think that the absence of any dedicated, paid, coordination made the project inefficient, in the sense that time was wasted in getting things started and delivered, and opportunities to learn with the network weren’t taken as fully as they might have been. The only coordination came from the already over-burdened volunteer KM4Dev Core Group, which has next to no formal structure or processes. That exacerbated the inn efficiency, yet the project delivered, people volunteered and all we know about learning tells us that a lot of people will have been enriched by the exchanges, the materials and their spin offs. Support for KM4Dev face to face meetings, including scholarships for people to attend, especially from the global South. Probably the most inspiring development is the number of people volunteering to contribute to KM4Dev, via a membership scheme of some kind. It will be interesting to see what emerges, how much money is actually generated. KM4Dev hasn’t done a review or evaluation of the IFAD project which would be a useful activity. While John Smith’s reports are a rich resource of information and analysis on KM4Dev his final report is deliberately not a set of recommendations or a plan. There is an interesting outstanding question as to whether the outcome of the whole KM4Dev futures process is that one, single community-driven strategy plan cannot be and shouldn’t be a target. That the logic of the report, driven by the network in discussions and in response to surveys, is instead of multiple future states co-existing within a healthy KM4Dev network - a model of one of those complex adaptive systems we are all learning to recognise and love.